Gaja Maestri is a PhD candidate in human geography at Durham University. Her current research is funded by the UK Economic and Social Research Council and focuses on the persistence of residential segregation, on public policies and on collective action in Italy and France, mainly with regard to the Roma and Travellers. Injustice: Why Social Inequality Still Persists, by Danny Dorling. Policy Press. 2015. In the UK, at least a sixth of households are considered poor, a fifth of people find it difficult to cope with the recent economic crisis and a third of families contain at least one person experiencing mental health problems. These are just few of the statistics that reveal the magnitude of the phenomenon of social inequality, the topic of Injustice. 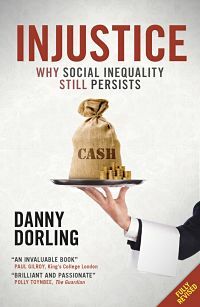 In this revised version of the book (first published in 2009), Danny Dorling tackles one of the most important problems affecting rich countries, that of persisting social inequality. Dorling (listen to his Social Science Bites podcast here) is a well established human geographer and cartographer who has written widely about health inequality and poverty. The 2015 edition of Injustice presents updated data, sadly showing how from 2009 inequality rates have further increased. This review by Gaja Maestri originally appeared on the LSE Review of Books blog and is reposted under the Creative Commons license (CC BY 3.0). Policymakers, activists and scholars will find this volume topical and compelling. The overarching question is why injustice still persists in rich countries. Although, in most of them, slavery has been abolished, segregation of African Americans has ended, and women can now officially vote, inequality is today on the rise: the richest 1 percent owned 41 percent of all the wealth of the planet in 2013, rising to 48 percent by 2014. The answer Dorling offers to this problem is that it is “in our minds that injustice continues most strongly, in what we think is permissible”. The book is structured around five main chapters, one for each widespread belief that bolsters injustice: the efficiency of elitism, the necessity of exclusion, the naturalness of prejudice, the positive effects of greed, the inevitability of despair. By providing a rich amount of panel data and maps (that are, however, sometimes so dense that they risk diverting the attention from the main argument), he shows how these five beliefs, that particularly affect also younger generations, are actually unfounded and provides evidence “to positively reject them”. Chapter 3 (“Elitism is efficient”) touches upon an aspect concerning all those working in academia: the fact that university fees in the UK (as in the USA) are increasingly expensive, therefore only accessible to a rich elite. This is a very important topic, and Dorling carefully examines the discourses and practices – such as the Programme for International Student Assessment (PISA) – that buttress the idea that only a minority are clever enough to achieve top positions in elite universities. The selection process is presented as being based on merit, through an intricate system of evaluation of students’ abilities since primary school, while the selection is actually based on wealth, whereby only the offspring of richer families achieve higher education qualifications in top ranking universities. This cannot leave the academic readers indifferent and surely pushes them towards self-criticism. The final chapter (“Despair is inevitable”) focuses on mental health problems, such as anxiety and depression, increasingly experienced by teenagers and adults in the US and the UK. This situation is due to the growing competition to which students are subject to, as well as the constant advertisements that bolster their need for consumption. This bears negative effects on social life as individualism can erode social trust and cooperation, consumerism has dangerous consequences on the environment, and the tendency of self-blame for one’s own economic situation may lead to an increase in suicide rates, as happened during the period of austerity after the 2008 financial crisis. This situation is also sustained by the pharmaceutical industry that profits from these pathologies. Injustice is definitely worth reading for all those interested in the eradication of social injustice: the book provides up-to-date data, an analysis of contemporary issues and practices underpinning inequality, and a concise interpretation of the main causes of the persistence of injustice, together with possible solutions. It certainly constitutes fundamental reading for activists and policymakers who need fresh data and original ideas. This however, constitutes both a strong and a weak aspect of the volume: while it is crucially important to bridge the academic world with that of policymakers, practitioners and activists, writing in an accessible way and without hiding behind difficult jargon, students of social inequality and injustice may not find an in-depth engagement with scholarly literature. For instance, despite the book ending on a hopeful note, throughout the chapters Dorling lingers on the binary divide between the poor and the rich, whereby the former appears as brain-washed and powerless, while the latter as ultimately characterized by greed and false consciousness. The book would surely benefit from a more nuanced analysis of compliance and resistance of lower and upper class members. Similarly, what could further strengthen the book would be a clarification of the relationship between politicians and bankers, political institutions and the market. It might appear obvious at first sight, but there is a long-standing and contested debate among Marxists about the relationship between political and economic elites, as well as different theories of the state that understand this relationship differently. Finally, Dorling states his own thesis about the fundamental role of beliefs without, however, discussing why he opts to put forward this explanation instead of alternative ones. For example, he does not mention resource mobilization theory that could show that it is not the beliefs of the rich minority that account for their enduring dominant position, but the resources they can mobilize, whilst the majority of poor have no access to similar resources, regardless of their acceptance of these beliefs. Similarly, Dorling does not explain why he does not consider path-dependency theory, which underscores the importance of lock-in effects of practices that become enduring even though often beliefs change. This entry was posted in Bookshelf and tagged Book Review, Danny Dorling, Inequality, Injustice. Bookmark the permalink. Post a comment or leave a trackback: Trackback URL.